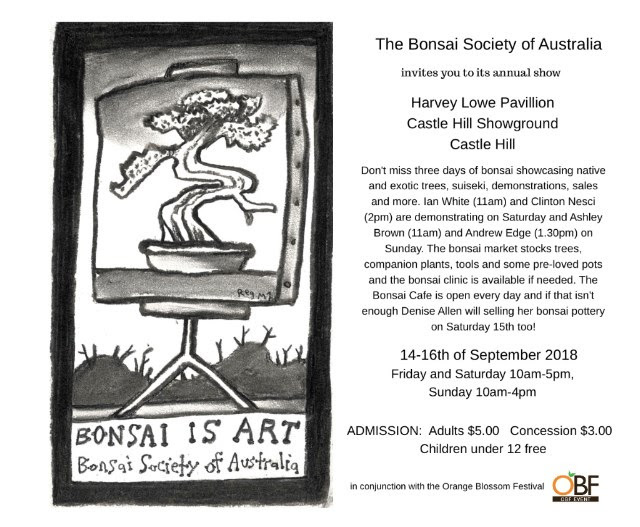 Our Annual Show | Bonsai Society of Australia Inc.
We have our show dates at last and this means we have until mid-September (just six short weeks) to get our trees ready for display. Why not display a tree or two this year and get them ready at our monthly workshop? Everybody is very welcome to attend. We hope to better label the trees this year returning to the previous format of common name, scientific name and years in training so, as this will take a bit of time to organise we will need your trees’ descriptions in advance. Please, if you are thinking of displaying any of your trees email these details to Maureen or Amanda.